I’ve gone through a lot of different systems in my life, so I wasn’t simply saying, “I need a day planner,” I was saying, “My current day planner isn’t working. It’s time to rethink.” I’ve been in the “rethinking” process continually. These pictures below show where I started. They are schedules I wrote when I was eleven years old. They were drawn with a knock-off, ten-marker Sharpie set with a short shelf life on a 5″x7″ manilla drawing pad that I had purchased at a zoo gift shop. I’ve come a long way since then. Self-imposed bed time of 9:00? I must have been the best child ever. You forget about assignments at school or projects at work. You forget what nights the moon is full and you’re accidentally wreaking havoc to small villages when you turn into a werewolf. You have a fluid work schedule. You don’t work 8-5; it’s different every week. Who would be able to (successfully) keep all that in their head? You live your life on sticky notes. There’s nothing wrong with sticky notes, but they can’t follow you wherever you go. You have a rich life: coffee dates, dinner dates, birthdays and birthday parties, vacations, graduations, potlucks, etc. You pay bills. Get a calendar. Right now. What you need will be different from what I need, but here are four essential components of any good planner and what they do for me. Weekly View: I know what’s coming up tomorrow, the next day and this weekend quickly. This keeps me mindful of the future so that nothing sneaks up on me (except sneak attacks). 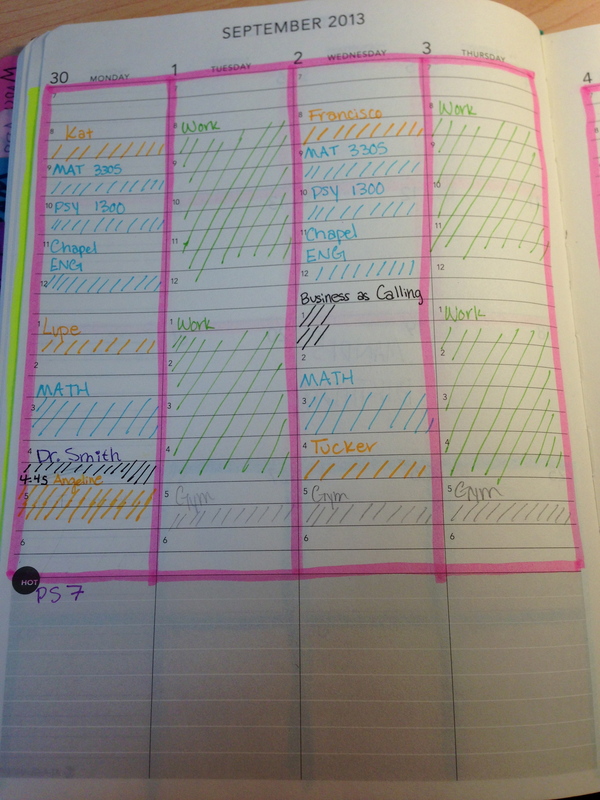 To-Do Space: I can see the homework assignments due every week, which I prefer to write on the day they’re due in my planner. Daily Do’s Space: There are tasks I want to accomplish every day, like reading my Bible and doing the dishes. I need a place to log and check these off on a daily basis. I am using At-A-Glance’s Weekly/Monthly 2013 Planner and it looks like this. I write down my specific, color-coded appointments and events for the next week on Monday mornings, so this page was filled in September 23rd. When I look at this, I know that I need to find time for my homework and I know exactly what time is free for studying, blogging and socializing. 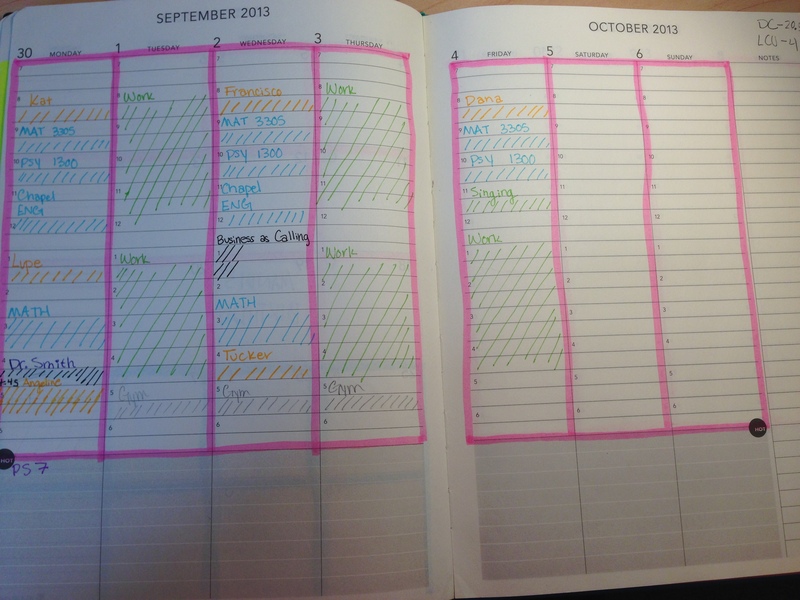 By the end of the week my planner looks like a rainbow waged a devastating civil war. Assignments (purple) are crossed off, appointments (green) have been scratched out, classes (blue) have been cancelled, my tutorees (yellow) have been scheduled and rescheduled (notice the white-out! 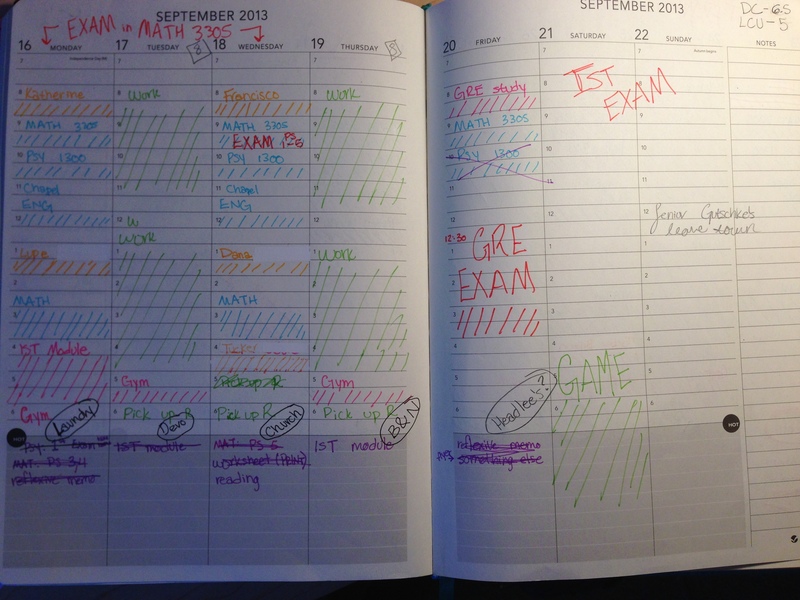 ), exams (red) have been listed, and study times (pink) have been planned. My color code system helps me look at something and immediately know what things I will be doing. I also keep a count of the hours I work in the top right hand corner so that I can match up my checks when I get paid. That’s so colorful and fun! I feel like this is the new age puzzle that would take hours for someone else to decode. This is why Type B’s look at us with wide eyes and run away! I love it though. My eyes are wide and my brain is a little overwhelmed, but I promise I won’t run away from you or A Mundane Writer either. 🙂 Thanks for sharing your methods…. Organization is supposed to be anti-overwhelming!